Par Bratt is an architectural designer at COOKFOX Architects in New York City. COOKFOX is an award-winning firm with a long history of sustainable design. It is the first architectural firm to have designed four LEED Platinum projects in New York City. 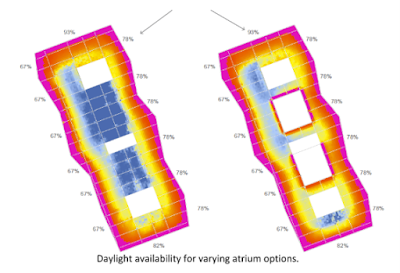 For a recent COOKFOX project, Par implemented a workflow where a parametrically setup daylight analysis in DIVA for Grasshopper informed and evaluated the size and proportions of an atrium in a multistory building. As more architecture firms move into the world of parametric design, it becomes increasingly important to include the analysis tools that go with the design and modeling tools within that same parametric environment.